Louis Lenz with part of his Texana collection, circa 1960. Courtesy of the Portal to Texas History. Image available on the Internet and included in accordance with Title 17 U.S.C. Section 107. 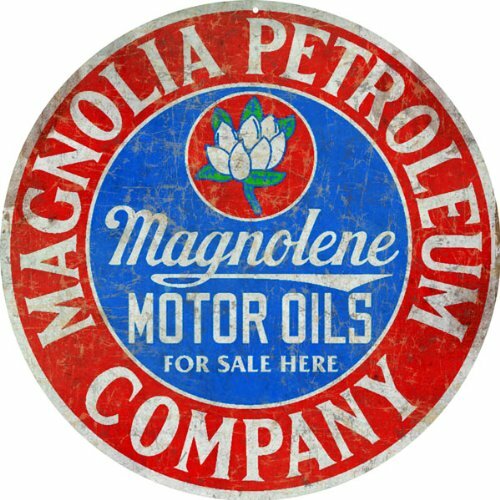 Magnolia Petroleum Company Logo. Image available on the Internet and included in accordance with Title 17 U.S.C. Section 107. LENZ, LOUIS (1885–1967). Louis Lenz, Texana collector, the son of Charles and Emma (Müller) Lenz, was born in Yorktown, Texas, on December 18, 1885. He spent his boyhood in Cuero and attended public schools and Guadalupe Academy. He enrolled at the Agricultural and Mechanical College of Texas (now Texas A&M University) in 1903 and graduated in 1907 with a degree in civil engineering. He was an avid football fan, and from his freshman year through Thanksgiving, 1966, he attended every Texas A&M-University of Texas football game played. After graduation Lenz worked for a time in the right-of-way section of the Southern Pacific Railroad and in 1912 worked at locating and constructing a railroad in Uruguay. In 1915 he married Neal Woodson. He worked as chief engineer for the Vacuum Oil Company until 1931, when that company became affiliated with Magnolia Petroleum Company, and Lenz served as district engineer for Magnolia in Lake Charles, Louisiana, until his retirement in 1951. Barker Texas History Center Plaque at the University of Texas at Austin. Courtesy of the University of Texas Libraries. Image available on the Internet and included in accordance with Title 17 U.S.C. Section 107. He then moved to Houston, where he collected Texana. In 1956 he designed the special medallion authorized by Congress to commemorate the 120th anniversary of the Texas Declaration of Independence. In 1963 his collection of over 4,000 books and journals was acquired by the University of Texas. The collection contained many writings on early Texas (in English, German, and Spanish) and Mexican documents dealing with Texas lands and land grants. The entire collection is housed in the Barker Texas History Center of the University of Texas at Austin. Lenz died on May 17, 1967, in Houston and was buried in Forest Park Lawndale Cemetery in that city. At the time of his death Lenz was vice chairman of the Harris County Historical Survey Committee, an honorary member of the Sons of the Republic of Texas, and a member of the Knights of the Order of San Jacinto. Houston Chronicle, May 18, 1967. Houston Post, May 19, 1967. Vertical Files, Dolph Briscoe Center for American History, University of Texas at Austin. Handbook of Texas Online, Clay Bailey, "LENZ, LOUIS," accessed April 23, 2019, http://www.tshaonline.org/handbook/online/articles/fle30. Uploaded on June 15, 2010. Modified on May 15, 2017. Published by the Texas State Historical Association.